张晓楠, 冯浩, 白雪, 应曼曼, 孙胜男, 宁宏. miR-15b-5p靶向CDK4抑制脉络膜黑色素瘤细胞增殖[J]. 中国医科大学学报, 2019, 48(3): 230-235. ZHANG Xiaonan, FENG Hao, BAI Xue, YING Manman, SUN Shengnan, NING Hong. 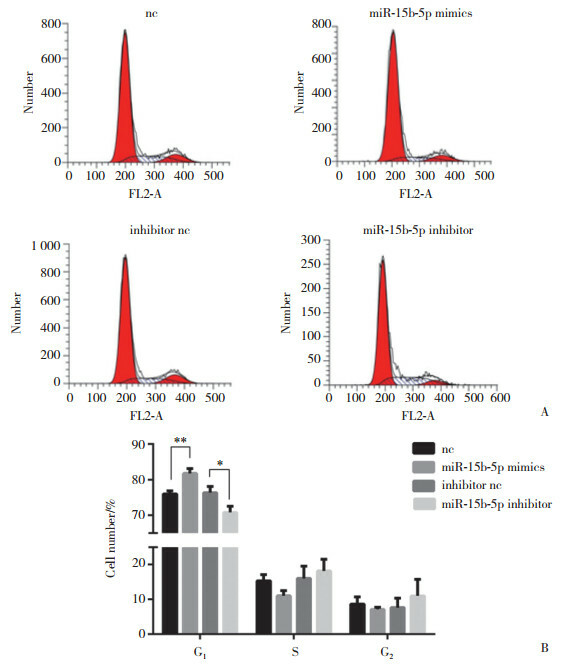 miR-15b-5p Inhibits Choroid Melanoma Cell Proliferation by Targeting CDK4[J]. Journal of China Medical University, 2019, 48(3): 230-235. Abstract: Objective To explore the inhibitory effects of mir-15b-5p on choroid melanoma cell line proliferation by targeting CDK4. Methods Dual-luciferase assay was used to verify the direct binding site between mir-15b-5p and CDK4 3'-UTR. MUM-2B cells were cultured in vitro and transfected with negative control RNA, mir-15b-5p mimics, inhibitor normal control (nc) RNA, and mir-15b-5p inhibitor. qRT-PCR was used to detect mir-15b-5p expression, western blotting was used to measure the expression levels of CDK4 in the cells, CCK-8 assay was used to detect proliferation capacity, and flow cytometry was used to detect cell cycle. Results Dual-luciferase assay verified that mir-15b-5p could bind to CDK4 mRNA 3'-UTR successfully. Compared to the negative control group, the mimics group showed significantly increased mir-15b-5p expression, decreased CDK4 levels, decreased cell proliferation rate, and increased proportion of G1-phase cells. Compared to the inhibitor nc group, the inhibitor group showed significantly decreased mir-15b-5p expression (t=25.01, P < 0.000 1), increased CDK4 protein level, increased cell proliferation rate, and decreased proportion of G1-phase cells. Conclusion mir-15b-5p can target CDK4, induce G1 phase arrest in cells, and thus, reduce the proliferation rate of choroid melanoma cells. BRANTLEY MA, JR HARBOUR JW. Inactivation of retinoblastoma protein in uveal melanoma by phosphorylation of sites in the COOH-terminal region[J]. Cancer Res, 2000, 60(16): 4320-4323.